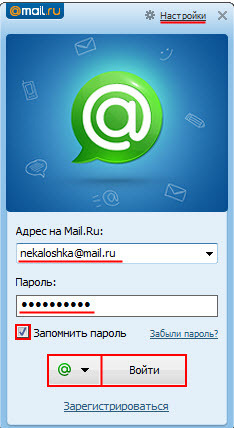 Mail.ru agent is a special narrow-profile program, allowing absolutely anyone of the Internet, which was on one of these services list.ru, mail.ru, inbox.ru, bk.ru – send SMS messages, use the interactive form of communication in the form of ICQ, as well as to check and edit own post. This utility is free and does not require registration of the client. Create your own mailbox to one of these systems, and then bind it to the program. To set up this utility, do not necessarily have expertise, enough to be able to read and to be patient. First of all, download the client program, Then install it on your computer. Start the mail agent and install the appropriate language, in this case, Russian. Make a brief tuning. Turn off unneeded features, and connect those, that you use. for example, not everyone will communicate in ICQ format, in this case the function can be deactivated. After that, how you have done this operation, note that the lower right corner. Before you must be highlighted green utility icon. Check out, everything to be done as, as well as in the instructions. Otherwise, then you can not read, how to configure the agent. To read the new e-mail, click the icon in the form of a letter, which is located in the system tray. Here you can see the subject of the message and the sender's name. As I said before, you can chat with people in ICQ format dialogs. The program's interface is identical to the normal client ICQ, In principle there is little difference between them. The only thing, that the mail agent addition, It allows you to send an email message. Technical Service strictly monitors the violators, spam accounts will be deleted after almost the first signs, so the probability of getting malware letter is very small. Note, you also will not be able to send spam, otherwise the system will fall under the ban. icon agent, located in the system tray, will regularly inform you about a new incoming message. Next, let's talk about, how to configure the agent, to be able to make calls from a standard PC to landline and mobile phones. To do this you must be in the presence of a special headset, namely handset. SILi ID – primary account number, He is assigned to each user when a new registration. User, having these instruments, can easily make calls to another PC absolutely free. It is true for calls to phone it will have to withdraw money, ie. before that you need to refill your personal account. This can be done via bank, terminal or an electronic wallet. Your account has to be a certain amount of conventional units, which is enough, to make a test call. To call the other party, you need to enter the phone number and click “Call”. Also you can use the video call. It is suitable only for those customers, who have computers with webcams. SMS messages. You can send messages from your PC to your phone absolutely free, but in reverse order, ie. from your phone to your computer – for a fee. Now you know, how to configure the mail agent. We also talked about the basic functions of the program, dismantled the types and cost of calls.